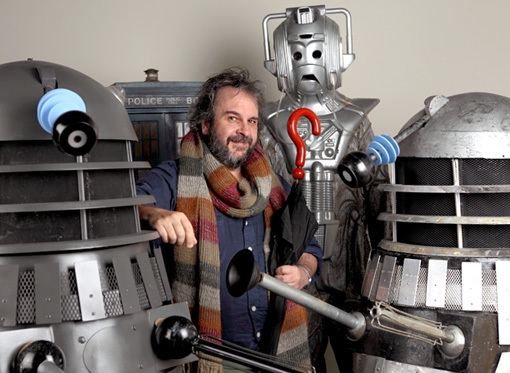 Making My 4th Doctor Costume: Is Peter Jackson a mystery auction buyer? A news story doing the rounds this week, emanating from the Entertainment Weekly website, concerns Lord Of The Rings director Peter Jackson. It’s been long known that Peter is a Doctor Who fan - especially of the Sylvester McCoy era. In August 2011 I reported the news that Peter Jackson showed off his original Doctor Who costumes to Sylvester himself when he was auditioning for his role in The Hobbit. The current story centres on a quote from Peter where he expresses his desire to direct a future episode of Doctor Who, stating he’d do it and only ask for a Dalek in exchange for his fee! But the part of the article that caught my attention more than anything was the photo of Peter surrounded by part of his collection of Who props. Firstly he is wear a (not so good) Tom Baker scarf. “So?” you might ask - but if you look carefully you’ll see it is part of a lot that sold at Bonhams in 2007. The sale was of particular note as and ORIGINAL Tom Baker velvet frock coat sold for £8,400 - but a poorly matched ensemble costume sold for a staggering £24,600! The scarf he is wearing is part of that costume. 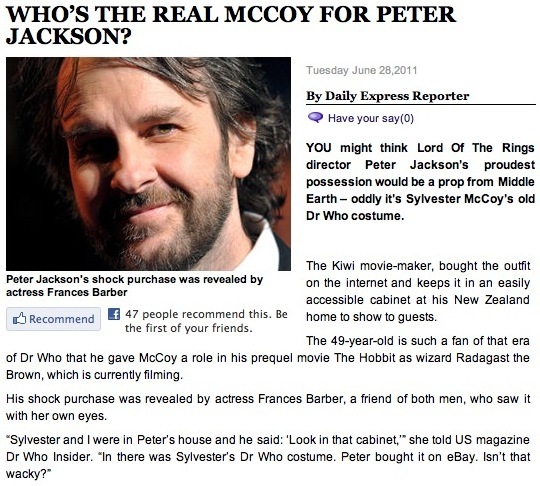 It would now appear the buyer was none other than Peter Jackson! Furthermore the Cyberman lurking at the back looks to be one of those sold at the 2010 Bonhams Doctor Who Auction.